"I have a passion for creating beautiful outdoor spaces". I was raised on a farm in California's Central Valley and experienced first hand the seasonal planting cycles. In the Spring time, the fields of hardy winter lettuce would give way to the planting of summer vines, such as sweet cantaloupe and sun-ripened tomatoes. During the height of Summer, fresh cut alfalfa lay in the sun and would scent the dry, hot air. With Autumn's Indian summer came the large mechanical cotton-picking machines, making their way through the vast, stark-white leafless cotton fields. The frost-covered fallow fields of Winter would wait impatiently for the cycle to roll on. In the midst of all this I planted a garden. My eldest sister gave me a copy of "Sunset Western Garden" book and I spent hours reading it and imagining what it would be like to grow all of those mysterious plants, One summer, she and I planted a vegetable garden under the light of the full moon. Exactly why I don't recall...but what I do remember is that I was extremely happy spending time in the garden. Writing a thesis is one of the requirements of the Masters program. The topic of my thesis was the historic campus of Mills College and was titled "Mills College - The Preservation of Richards Road". Richards Road is the beautiful tree lined main entrance to the campus established in the 1920's. The thesis covered the history of Mills and other Women's colleges and traced the origins and meanings of their campus buildings and landscapes. In conclusion, I assessed the planting along Richard's Road and offered ideas on how to ensure the preservation of this beautiful entry drive. While at Berkeley, I received first place in the San Francisco Garden Club Design Competition for the graduate division. This was my first residential design: a modern all green and white terraced garden in the Pacific Heights district of the City. This early success set the tone for my interest in residential garden design. Upon graduating from Berkeley, I was selected by the Garden Club of Virginia to be their first Fellow. I spent four months in the Northern Neck of Virginia documenting the gardens of Sabine Hall. This colonial garden was built in the1730's and has seen very little change over time. The GCV fellowship continues to this day. 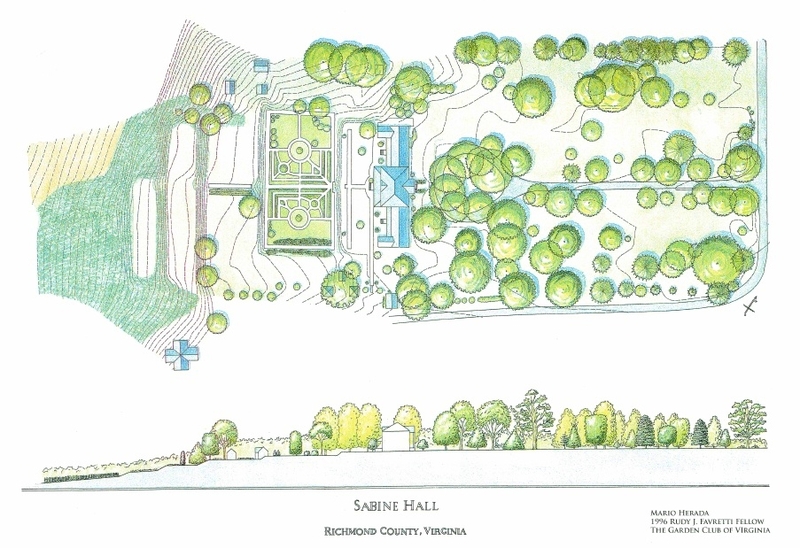 For the past twenty years the GCV has been documenting private Virginia gardens through it's fellowship program. I am honored to have been the first Fellow for such a successful endeavor. I returned to the Bay Area to begin my career in residential garden design. The majority of my career has been working for design/build firms. Seeing my clients needs and wishes go from a plan on paper to the reality of being built gives me great satisfaction. In 2006, I started my own landscape design firm: Zacate Landscape Design. My work studio is located in a converted dockside warehouse in the Dogpatch district of San Francisco. This once gritty working-class neighborhood now has many hip shared spaces and live-in-artist studios. In the past several years, four gardens I designed have received State Trophy Awards from the California Landscape Contractors Association,(CLCA). In 2015 one of my garden designs took the state's top honor, "Best of Show" by the same organization. That same year a garden I designed was included in an East Bay Home Tour. In 2017, I received two landscape design awards. The Association of Professional Landscape Designer (APLD), conducts an International Landscape Design Awards program and honored me with a "Silver Award". I also earned an "Honor Award", the highest level, from the Perennial Plant Association (PPA,) Landscape Design Awards competition . In the autumn, I took part in APLD's Mentor Project. I mentored a student in the Department of Horticulture at Iowa State University. This year, 2018, I had the privilege of being the keynote speaker at a recent APLD Bay Area Designer Spotlight Speaker Series. The topic of my lecture was the relationship between garden design and the architectural style of the house. 2018, has also seen me earn two design awards. These include a "Silver Award" from APLD's International Landscape Design Awards program and an "Honor Award" from the Perennial Plant Association (PPA). I look forward to working with you and designing the garden that you will feel happy spending time in.